Agriculture districts, also known as agricultural preserves and incentive, protection or security areas, comprise geographic areas (generally 100-500 acres) where farming is a priority land use and commercial agriculture is encouraged. Most commercial agriculture and allied farm businesses require large tracts of land or contiguous smaller parcels to be economically viable. Enrolling land in an agriculture district opens a number of incentives and protections for horse farm owners and equine-related producers that can include reduced property taxes, increased eligibility for conservation easements and protection against nuisance suits. Land eligible for enrollment must be in agricultural production and/or animal husbandry – e.g., commercial operations for crops, livestock or related products (such as processing, drying, storage, and marketing). In states with broad definitions of agriculture, benefits apply to all equine operations (products and/or services) while states with narrower definitions only extend perks to farms that breed, raise and sell horses. In between are states with programs that cover breeding operations but differ in their criteria for boarding, training and/or riding facilities. Horse farm owners need to review their state’s definitions of “agriculture,” “farm” and related terms as they pertain to programs that may apply to their properties. Unlike restrictive zoning districts that delineate areas governed by local land use regulations, enrolling land in an agriculture district is voluntary and withdrawal from the program is an option. Prior to 2011 commercial horse boarding operations in New York were eligible for agricultural district protections and agricultural assessment tax benefits if they have at least seven acres, board ten or more horses and gross $10,000 annually. A 2011 amendment to the agriculture and markets law in relation to commercial equine operations in agricultural districts extended benefits to comparable operations that provide horse training, trail riding and riding lessons. In 2005 North Carolina authorized a new Enhanced Voluntary Agricultural Districts option that counties and cities can add to their local farmland preservation ordinances. This EVAD option created a new category that would offer landowners an additional tier of benefits, if they were willing to waive their right to withdraw from the voluntary agricultural district program at any time. By qualifying for enrollment in an EVAD hay growers have increased their advantage if they need cost share for BMP’s such as erosion control, crop rotation, fencing, live stock exclusion wells and compost facilities. They receive 90% funding versus 75% funding for growers not enrolled in an EVAD. 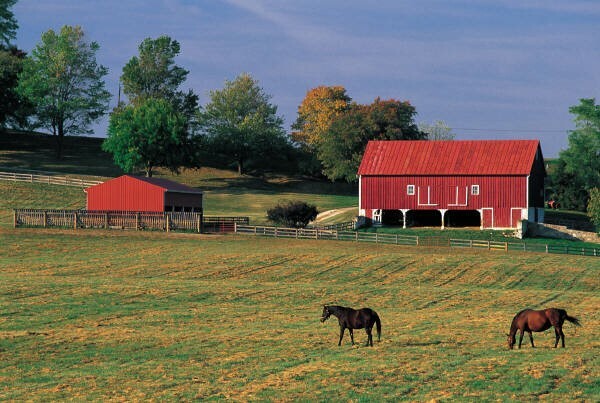 Silver Springs Stud Farm is 305 acres of prime farmland outside Paris, Kentucky. It is enrolled in the Historic Coopers Run Agricultural District that was established in 1998. Farms in agricultural districts tend to maintain their market value. Potential buyers have extra assurance that the community will retain its working farm characteristics. Agriculture district programs are administered at the local level through county agricultural boards or conservation agencies. Typically, rural landowners must apply to these local entities for inclusion in an agricultural district. Eligibility may be prioritized on a case-by-case basis relative to other applications and related programs. States and localities established these districts beginning in 1965 in an effort to preserve large parcels of farmland from development and/or fragmentation, to encourage agricultural landowners to maintain land in agricultural production and to reduce conflicts between rural and urban landowners. Agriculture district programs discourage investments in infrastructure such as roads, water and sewage lines that increase the area’s attractiveness for non-agricultural development. State programs vary in the amount of contiguous acreage that must be enrolled (either individually or collectively among various landowners or renters) ranging from 10 (usually urban community gardens) to 500 acres and the length of the enrollment period – between three and twenty years. Eligibility also considers other factors such as gross sales, soil type and agricultural assessment value. Landowners may renew enrollment for an entire parcel or for a portion of the land. Establishing agriculture districts and increasing the number of farms and acres enrolled in them makes a bigger voice for all of agriculture, including equine operations.